During our three weeks of bird-watching in Singapore we didn’t only encounter large birds like the Asian Openbill and the Oriental Pied Hornbill. 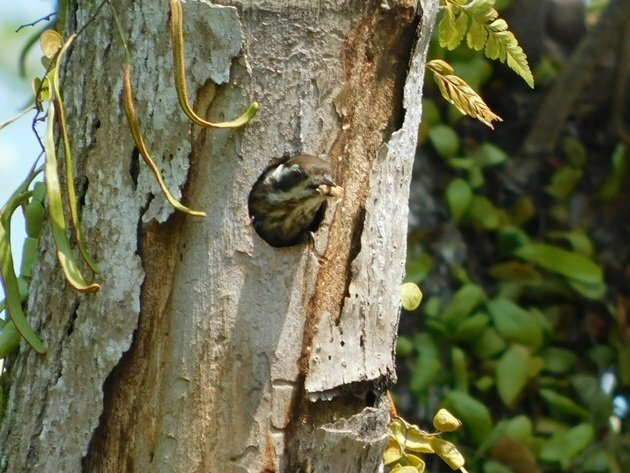 There was one tiny bird that we observed almost every day in a variety of habitats. 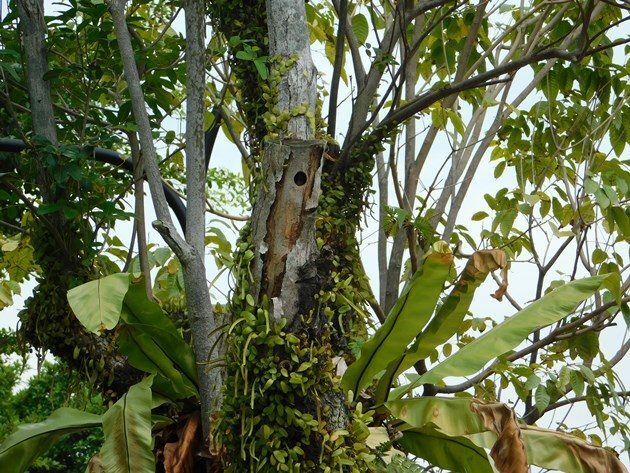 The Sunda Pygmy Woodpecker – Yungipicus moluccensis is a tiny bird measuring only around 12-13cm and we observed it in parks, gardens and mangrove areas. Sunda Pygmy Woodpeckers could easily nip around the back of a tree trunk and be obscured, but I was able to capture some photos of this tiny bird. 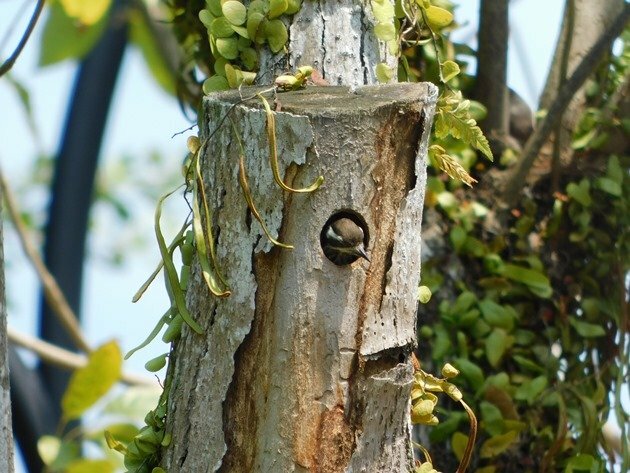 The photo above is of a Sunda Pygmy Woodpecker nest in a trunk right against a footpath. The hole is so perfectly round to almost look man-made. We were fortunate enough to be able to sit patiently in the distance and watch the parent return on several occasions with food. 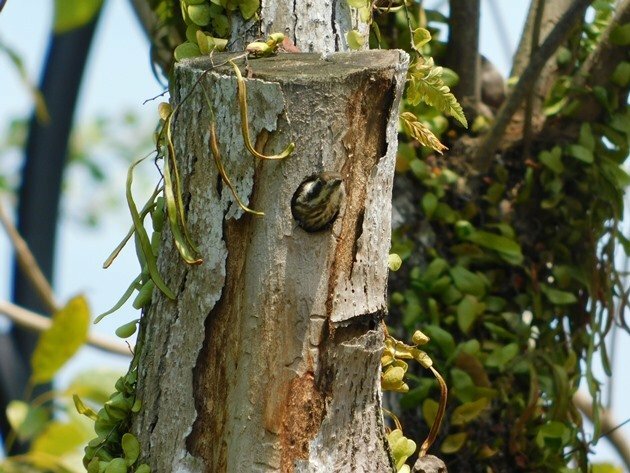 The faecal matter was also removed from the hole and there could be a wait of up to thirty minutes before the Sunda Pygmy Woodpecker returned from foraging. I found it easier to photograph the Sunda Pygmy Woodpecker leaving the hole, because she would fly straight in on most occasions. On one occasion the Sunda Pygmy Woodpecker flew above the hole briefly and then dropped down to enter the hole and I could capture her entering rather than leaving the nest hole. 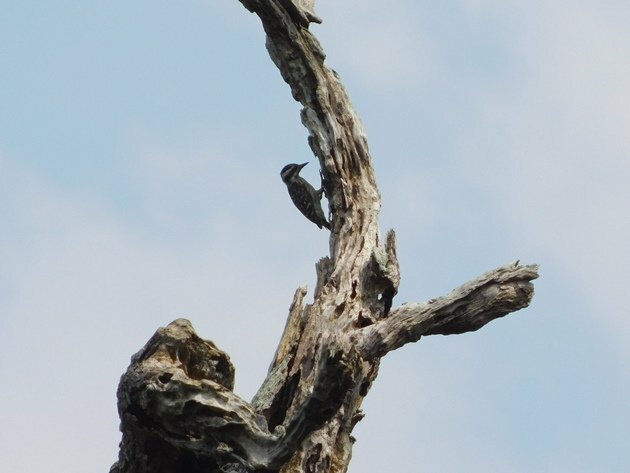 In the mangroves the Sunda Pygmy Woodpecker was more easily observed if it was on a dead tree trunk out in the open. They are so small that the sound of them chipping away at the wood is very quiet and not something that will give them away. 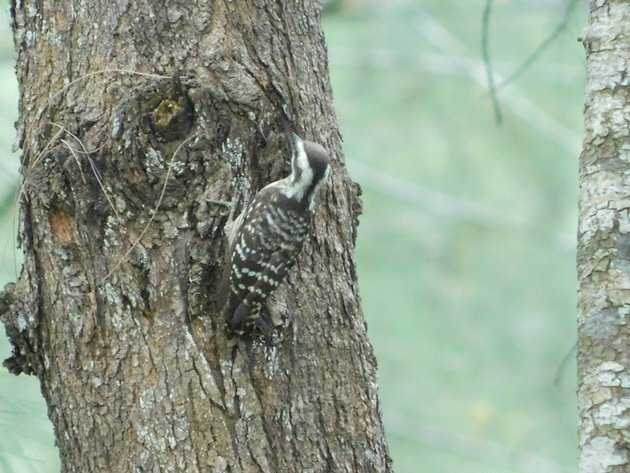 If it was not for the silhouette of the Sunda Pygmy Woodpecker it would have eluded detection on many an occasion! 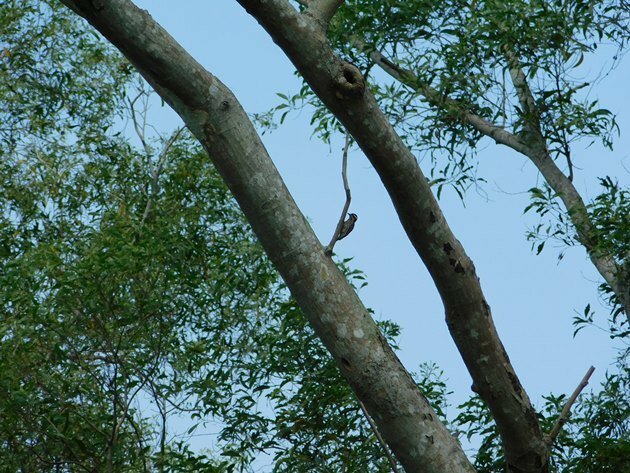 The trees are so tall in Singapore that it could be challenging looking high up into the canopy, but the Sunda Pygmy Woodpecker was mostly found on the trunks and branches. 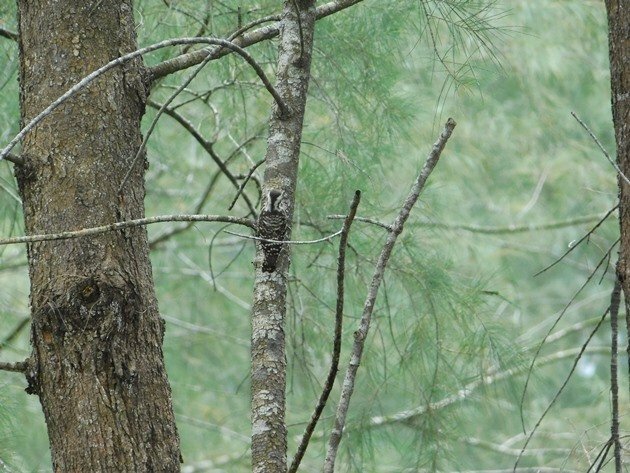 On some occasions the Sunda Pygmy Woodpecker had the perfect camouflage in the forests and would blend right in among the tree trunks. 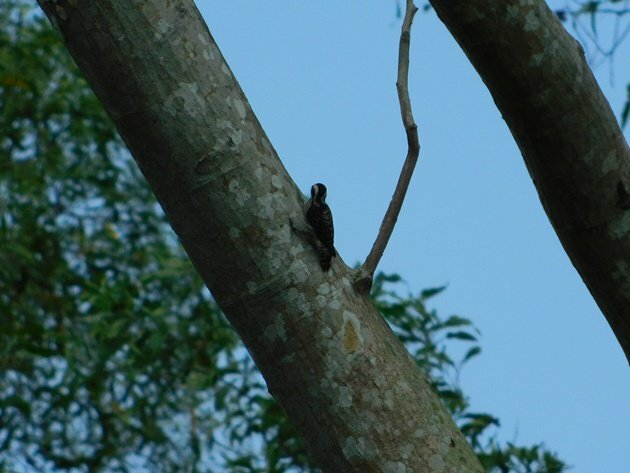 We were very fortunate on our visit to Singapore that we were able to observe the Sunda Pygmy Woodpecker almost daily. 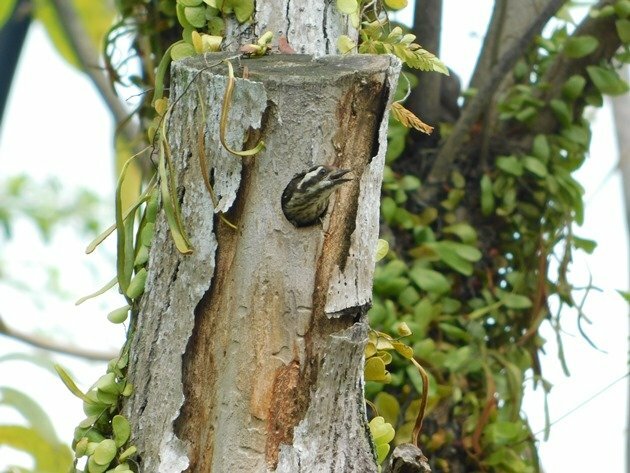 We also observed the Laced Woodpecker shortly after arriving in Singapore and on several other occasions. We observed the Common Flameback, Banded Woodpecker and Rufous Woodpecker in several locations during our visit as well. 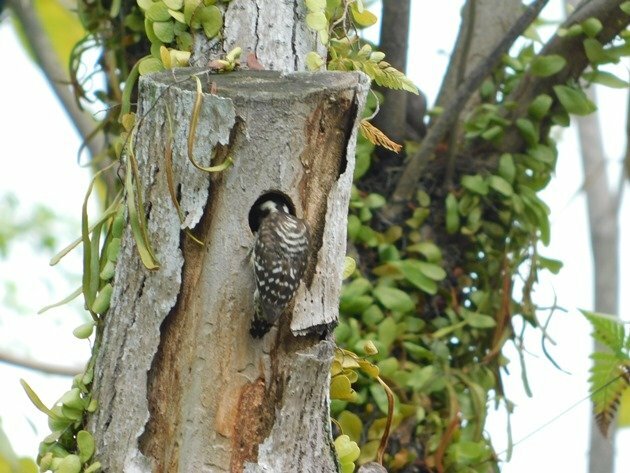 Due to the fact that we were visiting from a continent without any of the Woodpecker family it was particularly enjoyable to observe them in Singapore! 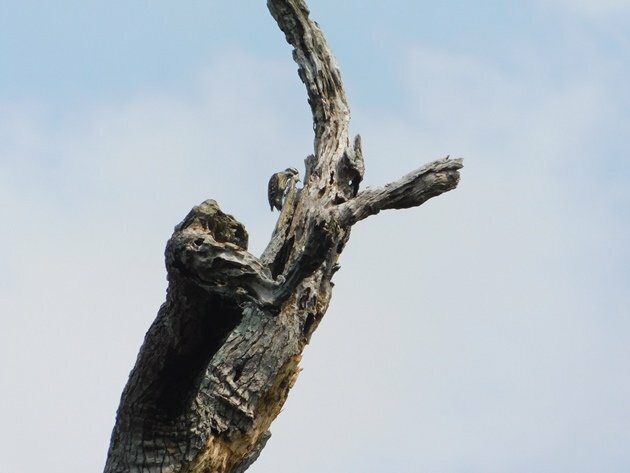 Love those woodpeckers! It’s amazing how many good looks you got… It looks smaller than our downy! Thanks for the interesting report. Yes, Karen, it is smaller and lovely to see almost daily in Singapore!